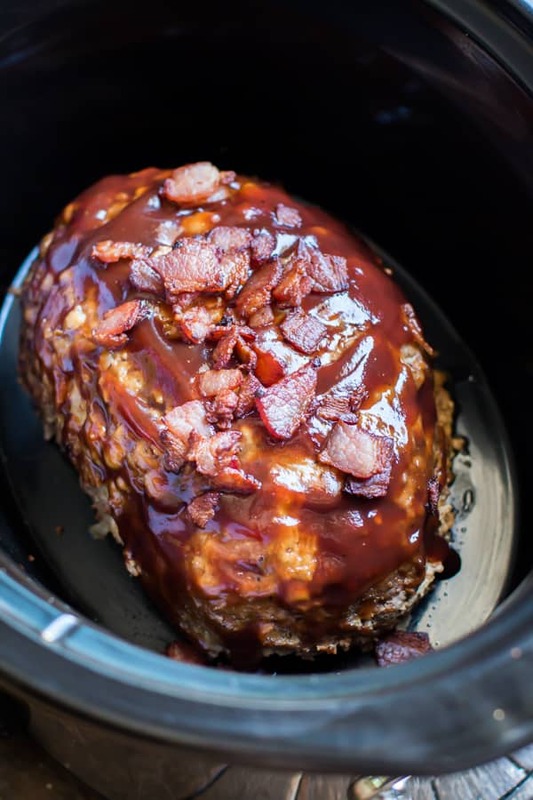 Bacon Barbecue Slow Cooker Meatloaf is my favorite meatloaf with added flavors! Hi all! I am back from San Diego this week. 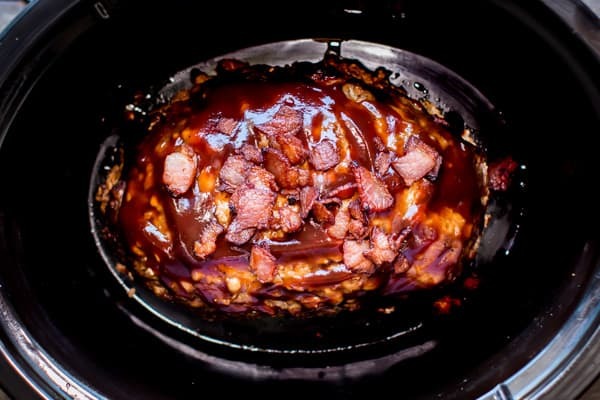 I made you all a Bacon Barbecue Slow Cooker Meatloaf! This little beauty was fantastic! My husband kept saying how much he liked it over and over while we ate. 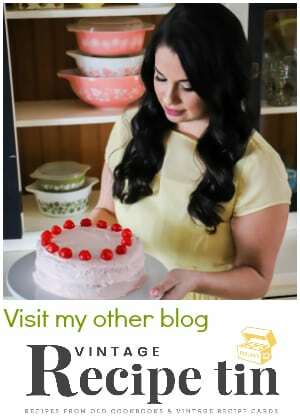 This meatloaf is a twist of my perfected Slow Cooker Meatloaf, a recipe I adapted of my moms. 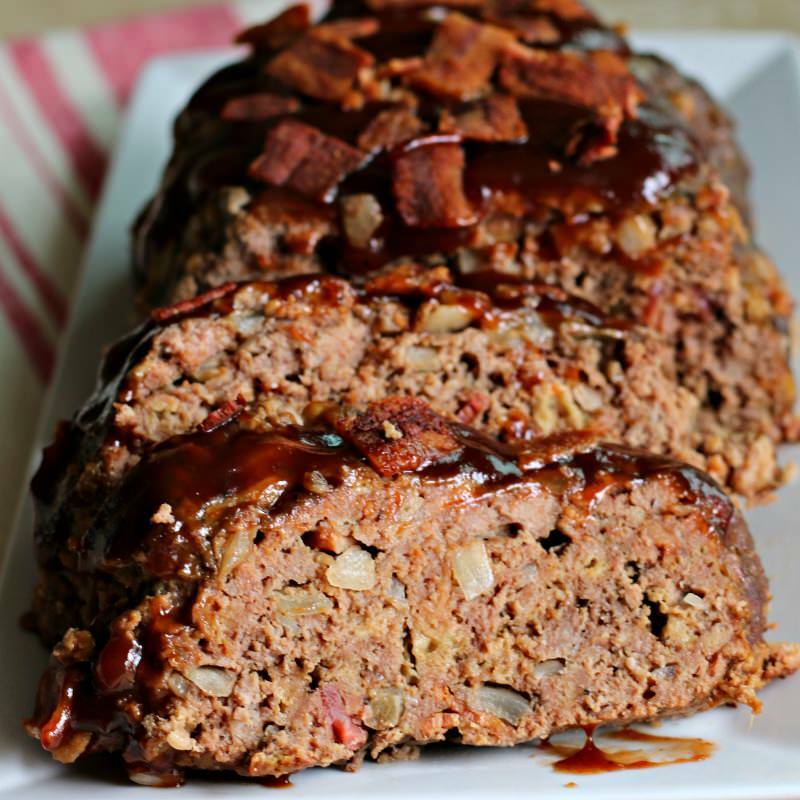 If you love meatloaf and you love barbecue, I think you will love this! I had crazy dreams that night before the show, one dream I had forgotten a key ingredient, another dream that someone put all my salsa ingredients out for the crew to eat before the taping. The morning of the show came so fast, so much to do! I packed up the 2 large boxes of food and the crock pot from the hotel room down the elevator and out to the parking lot, all while wearing heals. I really wish I would have brought my husband, just for that moment of carrying all my stuff, even though it would have cost me 500 more dollars. Once I got to the TV station, there was no time to be nervous. The receptionist brought me to the green room to wait for few minutes. You probably know, but the green room is not green! Then someone ushered me and all my food stuff out to the set. The kitchen set was behind the cameras for the morning news. I had to unwrap my tin foil, set out dishes while trying to be quiet, as I am trying to watch the morning news anchors live on TV behind me. It was all so fascinating. At the time I still didn’t know which one of the news anchors were going to cook with me. I barely had everything set up and I was told to do a teaser for the camera. They told me to wave, smile and pretend I was still setting up. That went ok, except while looking at the camera waving and smiling I could see myself in the screen under the camera, I felt like a goon! About 5 minutes later the lady news anchor Heather Meyers came over and introduced herself. Such a pretty and confident woman. I later saw on her twitter page that is the recipient of 8 Emmy Awards! We talked for about 30 seconds about what the segment would be like. Then it was time! 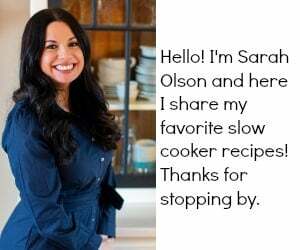 Heather glided me through the segment, I just focused on preparing my recipe as I also tried to answer her questions with out flubbing my words (which I had no idea what she was going to ask). I wish I could show you the video but it is no longer available, the news channel was bought out and my video deleted :(. Enough about me here is my meatloaf recipe! This meal is a spin off of my favorite slow cooker meatloaf. You won’t be disappointed with this meal! Here is my YouTube Video of this meal. You can follow me on YouTube here. In a large bowl, add the eggs, onion, barbecue sauce, milk, onion powder, salt and pepper. Crush the saltine crackers in next and mix this all together with clean hands. Add the ground beef and cooked bacon in next, only mixing everything until it just comes together. 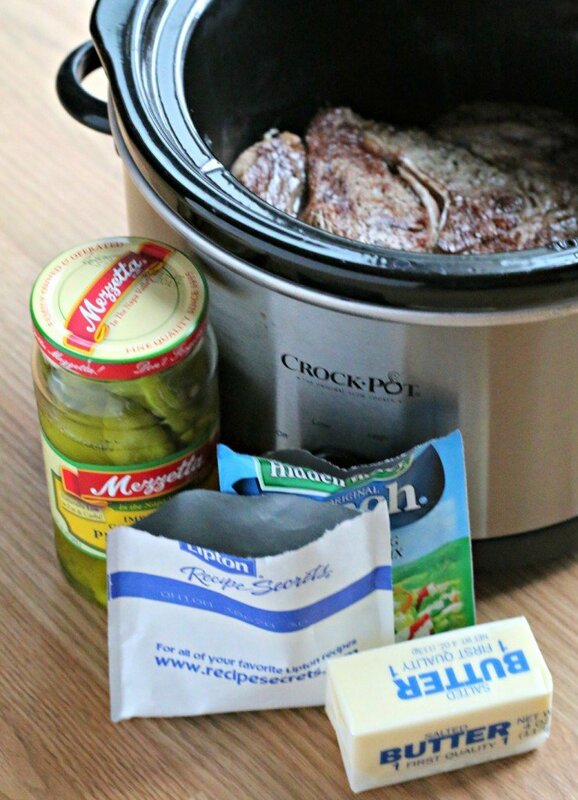 Spray a 6-quart slow cooker with non-stick spray, and shape the meat in to loaf shape in the slow cooker. Cover and cook on LOW for 5-6 hours, without opening the lid while during the cooking time. Scoop out the fat and discard. Top the meatloaf with the additional barbecue sauce and crumbled bacon. Serve and Enjoy. If you want to use something other than saltines (such as oatmeal or panko bread crumbs), the amount of saltines crushed is 1 1/4 cups. Looks and sounds heavenly!! 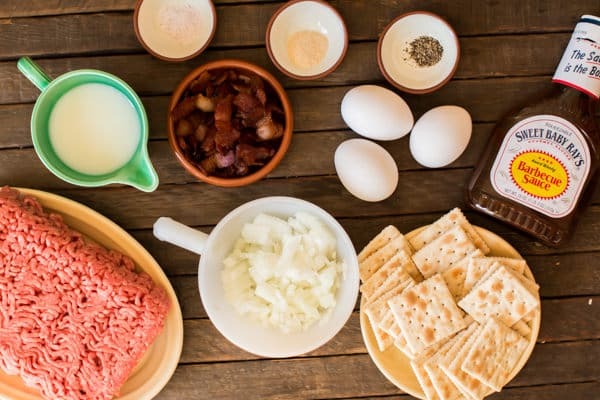 Just one question…in the directions it says add the ground beef and bacon–how much bacon? Should it be cooked bacon? It isn’t listed in the ingredients just the topping ingredients. THANKS!!! I can’t wait to make this for my boys, they will love it. And how exciting for you! yum! this sounds great! I love everything bacon! I have yet to make meatloaf in the slow cooker. I have got to put this on the weekly menu. You are a natural in front of the camera! I’m so proud of you! My gosh, I didn’t realize you had to prepare everything in advance. This meatloaf is the perfect comfort food dish to come home to after a hectic trip to CA! This looks like the perfect meatloaf recipe!! Great post, Sarah! I love meatloaf and admit, have never made one in the slow cooker. OK…that needs to change because this looks amazing!! The meatloaf looks wonderful and I loved your interview! Hope you got some time to enjoy a little bit of San Diego while you were down here. Congrats! Would this work in 1.5 qt slow cooker? I’m not sure. 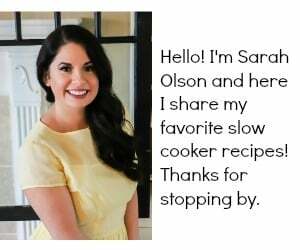 I do have a 1.5 quart slow cooker, and I’m thinking you may want to cut the recipe in half. 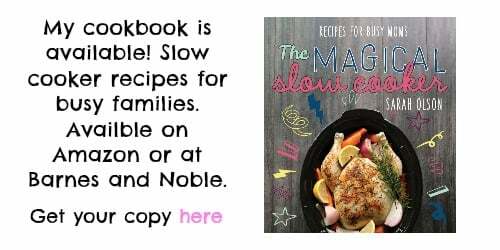 Will have to try this recipe!!!! Last time I made a meatloaf in my crockpot – I put some slices of bread in the bottom – put the meatloaf on top. All the grease went into the bread so I could just take the meatloaf out and throw out the bread. About how many slices of bread did you use to soak up the grease? I made this recipe on Hallowwen and it was a crowd favorite! I came back to use the recipe again, but the only ingredients showing are eggs. Help! I got it fixed! Something was wrong on the back end here, thank fully I still could see the recipe on my end and fix it so you can see it now! Have a great day. Is there a way to prepare withought eggs? Try using a little more milk instead. I haven’t tried this before, but it may work! New single father of 3 thanks you. Could I use oatmeal instead of saltine crackers? If so, how much would you recommend? Start with 1 1/4 cups, you can always add a bit more if your meatloaf is too moist to shape into a loaf. If I try this with ground turkey is it the same cooking instructions and time? May need a bit more crackers if the turkey is really moist. But other than that should do fine. If you wanted to use Panko bread crumbs, rather than Saltines, how much would you use? I just measured out the saltines when they are crushed. It’s 1 1/4 cups. I hope that helps!